Understand the concept of definite integrals of functions and its properties. What is differential calculus – an 4 introduction One of the most fundamental operations in calculus is that of differentiation. In the study of mathematics, there are many problems containing two quantities such that the value of one quantity depends upon the other. A variation in the value of any ones produces a variation in the value of the other. For example the area of a square depends upon it's side. The area of circle and volume of sphere depend upon their radius etc. 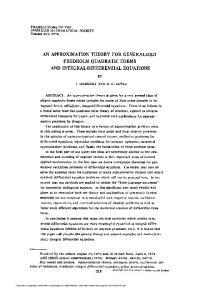 Thus differentiation is a process of finding the derivative of a continuous function. It is defined as the limiting value of the ratio of the change in the function corresponding to small change in the independent variable as the later tends to zero. Derivative of functions in parametric forms If relation between two variables is expressed via third variable. The third variable is called parameter. More precisely a relation expressed between two variables x and y in the form x=f(t),y=g(t) is said to be parametric form with t is a parameter. In order to find derivative of function in such form, we have by chain rule. We differentiate such functions by taking logarithm on both sides. This process in called logarithmic differentiate. If is differentiable, we may differentiate it w.r.t. x. The LHS becomes which is called the second order derivative of or and is denoted by . It is also denoted by . If we remark that higher order derivatives may be defined similarly. Let y=f(x)be a curve. The derivative of f(x) at a point x represents the slope of the tangent to the curve y=f(x)at the point x. Sometime the derivative is called gradient of the curve. What is Integration (definition) Integration is inverse process of differentiation. 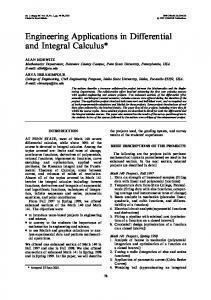 Integral calculus deals with integration and its application. It was invented in attempt to solve the problems of finding areas under curves and volumes of solids of revolution. Also we can define integration as the inverse process of differentiation . The process of finding the integral is called integration. The function which is integrated is called the integrand. Usually we make a substitution for a function whose derivation also occur in the integrand. Question.15 The value of p and q are. Practice makes a man perfect and that’s what mathematics demands. . So, students ‘all the best’ for your upcoming examinations . keep practicing. 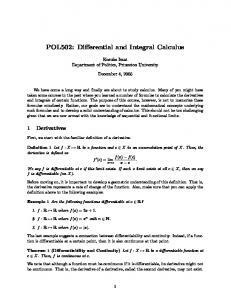 Report "Basic Concept of Differential and Integral Calculus"